Utah Transit Authority lets patrons pass contactless smart cards over electronic readers when boarding buses, trains or light rail cars. Serving millions of commuters is a big job, especially in a state like Utah. Most of the populace is concentrated in urban areas, and the Utah Transit Authority (UTA) serves six counties over 1,400 square miles, including Salt Lake County, which was home to more than 1 million people in 2008, according to the U.S. Census Bureau. The authority deployed a handy payment system to speed fare payment and collection - a system that may be the future of public transportation as we know it. In January 2009, the UTA announced its electronic fare collection (EFC) system that allows patrons to pass "contactless" smart cards over electronic readers when boarding buses, and train or light rail cars, eliminating the need to pay drivers in person or flash passes. A chip in the card transmits a signal when it's close to the reader. "The ability to have a card with this technology and be able to board a vehicle, tap a reader and get on makes things a lot more convenient for the customer. It allows them to board more quickly," said Craig Roberts, manager of technology program development for the UTA. "It allows us to collect a lot of information about ridership and trip patterns." The UTA markets its EFC deployment as a "tap on, tap off" system - riders tap their card against a reader when they board and exit. Buses have card readers at each door, and card readers also are mounted on several locations on platforms at train and light rail stations. "We've asked everyone to both tap on and tap off, which gives us information about where people board, where they get off," Roberts said. "We will be able to have planning data that shows us complete trips people are making within the system, and that is really valuable to us." After swiping the card, the electronic reader responds with a colored light and a beep. Green and high tone means the pass is valid; red and low tone means the pass has been rejected, perhaps because the card has been deactivated or reported stolen; yellow and mid tone indicates the rider must take further action like upgrading the pass to use other modes of transportation. The EFC system currently serves riders with an Eco Pass - a company-sponsored annual pass that employers issue to employees - or an Ed Pass - a school-issued pass. In each case, the company or school has paid for the passes through a contract with the UTA, so patrons can use public transportation for free as long as they're employed by or enrolled in a participating company or school. The system also accepts contactless credit and debit cards like Visa payWave, MasterCard PayPass and American Express expresspay. Roberts describes this as an open-payment system because users can use bank-issued or other cards instead of UTA-specific cards to pay for rides. This is less restrictive than some other "closed" contactless systems, which Roberts said are typically proprietary systems. "They're developed with a specific contractor, and the transit agency issues its own card," he said, but with the UTA system, you can use the same card to ride the bus as you would to pay for your groceries. One "closed" card he compares the UTA system to is the SmarTrip card offered by Washington, D.C.'s Washington Metropolitan Area Transit Authority. It's a plastic, rechargeable fare card with a computer chip that people touch to circular targets on or inside of fare gates to pay for rides. Riders can purchase the card and add money to it as they wish, but transportation is its sole use. However, open systems aren't found only in Utah. The Octopus Card - a multipurpose card used to pay for public transit and purchases from vending machines, stores and schools - debuted in Hong Kong in 1997. Contactless cards are used for transit in other places as well. The United Kingdom's Oyster card is a contactless offering for travel via public transit, but like the SmarTrip card, is only for transportation. The UTA spoke with other smart card-using transportation authorities years ago to find out what exactly EFC entails. They included the Washington Metropolitan Area Transit Authority, the Massachusetts Bay Transportation Authority and the Chicago Transit Authority. "I was retained by UTA to try the strategy for electronic fare collection," Roberts said. He estimates that he began working for the UTA in 2005 as a contract employee. "Then as we got into it and began to chart the course that we wanted to follow, the UTA chose to hire me as a full-time employee because it became clear that this was going to be a job that would be going on for a good long time." 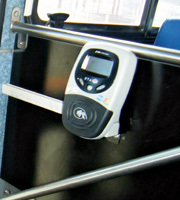 The authority deployed the contactless cards in a pilot project in December 2006 on the UTA's ski bus service. Roberts and his colleagues put the technology on 41 buses that took skiers and ski resort employees into canyons and tested the system in the 2006-2007 and 2007-2008 ski seasons. "We did it so we could learn how to do it, and we learned an enormous amount," Roberts said. "It really did inform and help us to understand what was involved." The UTA chose ERG Group as the vendor for the pilot program, the same company that supplied the technology for the public rollout currently under way. The transit authority awarded its second contract to ERG in October 2007 for three years with three additional one-year options. ERG manages all of the data the cards collect on the back end through a system called eO, or the easy open payment system. The card readers, also called validators, record information the UTA can view through eO, which contains a database of authorized users. "What's different with our fare collections system and others is we don't have equipment. We have a validator that resides on the vehicle, but that's it. There are no added machines, there are no point-of-sale devices out in the market," said Michael Cook, vice president of open payment systems at ERG. The transactions and ride authorizations are facilitated by software. When a rider taps his or her employer- or school-issued card to the reader, the information on the card is checked against the available information in the database. The transaction process is similar with debit and credit cards. "Let's say you had not registered and you're a first-time user. You take out your bank card and that reader will read the bank card information, and it will deliver it to our server where we will then deliver it to the payments network for authorization," Cook said. Currently authorizations and transactions occur when someone taps on, so it doesn't matter when he or she exits or how long the ride goes, but as data is collected and assessed on transit routes and the time spent riding, payment structures may change. "In the future, point A and point B will be defined and there may be some distance-based fares, so it will matter where you tap off, and the fares will be calculated after you tap off," Cook said. He envisions that it may be similar to buying fuel for a vehicle. "If you have distance-based fares, you don't know what the fee will be when you get on, so it's more similar to pumping gas. When you pump gas and you present your card at the pump, it goes through an authorization," Cook said. And depending on how much you pump, your card is debited or charged that amount. He imagines the situation will be similar with the UTA's EFC system. Of course, people can still pay with good old-fashioned cash. But Roberts thinks that cash transactions will occur less and less, perhaps similar to how paying with checks has fallen out of favor today. "It wasn't that long ago that all of us were writing checks at the grocery store. And now, somebody who writes a check at the grocery store kind of annoys everybody behind them because they're taking more time than everybody's used to," he said. The UTA also plans to let people track their travel history online through the transit authority's Web site, thanks to the information collected by eO. Transit authority personnel can also track rider activity, but not by personal identity. "We have designed the system from the beginning to make sure that no employee of UTA can track somebody's individual movements by their identity. Thus, with our third-party pass program, the schools employers and ski resorts provide to us a list of card numbers," Roberts said. The UTA tracks information by these numbers, not by name. Cook said the UTA is currently in Phase I of the project. When Phase II is rolled out, possibly in late 2009 or 2010, people can buy additional fare products within the credit and debit architecture, like prepaid passes of varying amounts or gift cards.